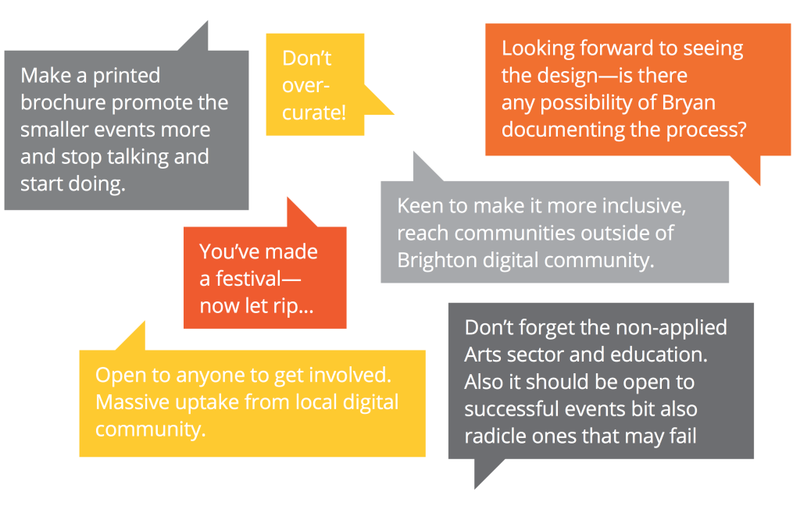 I was lucky enough to be selected to carry out the brand refresh for the Brighton Digital Festival. I know some of the other applicants and I feel honoured that my proposal was chosen out of so many from some very talented independent designers and agencies. Now I feel the weight of that decision, knowing that much of the design community will be critiquing my work! In my proposal and in subsequent discussions with the festival organisers I stressed the importance of undertaking research to determine what the festival is, what it stands for, it’s values and it’s personality. This is a normal part of a branding project, wether it is simply a discussion between a designer and the business owner or a full audit, interviewing board members, having brand workshops and collating that information into a document. So this is the approach we have taken but, importantly, the research has taken the form of an open survey in keeping with the spirit of the festival. Looking forward to seeing the design — is there any possibility of Bryan documenting the process? I think it’d be cool for the public to have a better idea of how things like this are decided. There’s so often misunderstanding (see London 2012 branding) about what designers and organisers were trying to achieve — it’d be cool to lay it all out on the table, as it were! Well, I wasn’t expecting that response! But after discussing it with the event organisers and steering group I have decided to to just that; lay it all on the table. Well, blog. So here are some highlights from the brand strategy document that is a culmination of the survey results, research, steering group discussions and a bit of, well, let’s call it designer’s intuition. This will become the brief for the visual identity; the document to align the identity to to make sure it gets the right message across. Now that this section of the process is complete, and the context and strategy has ben defined a little more clearly, I’m really looking forward to cracking on with the next phase – getting some design ideas going! This is really great, I’m going to be doing the same thing with the website planning. Nice one Andy, post a link when it’s ready.